At every turn around Ypres there is a sign for a World War 1 cemetery. We decided to visit Tyne Cot, just a short drive from Zonnebeke and Ypres and the largest Commonwealth cemetery in the world. Parking at the side of the road, we started our visit at the very impressive and well laid out visitor centre. Lots of fascinating information, personal stories, artefacts and letters and so much to read and take in. 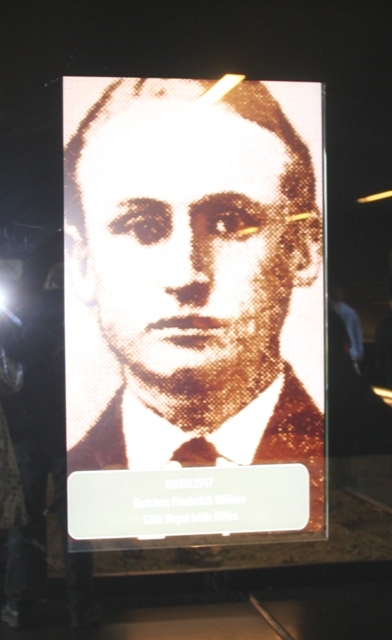 Constantly flashing up on a wall is a picture of a solder killed in the conflict together with his name, age and regiment. Very sombre and very moving. Outside it really hits home. Rows and rows and rows of headstones – 11,956 burial plots in this place alone. The numbers become reality and the scale of the slaughter is very apparent. Just in this little area alone 400,000 British and Commonwealth soldiers lost their lives. 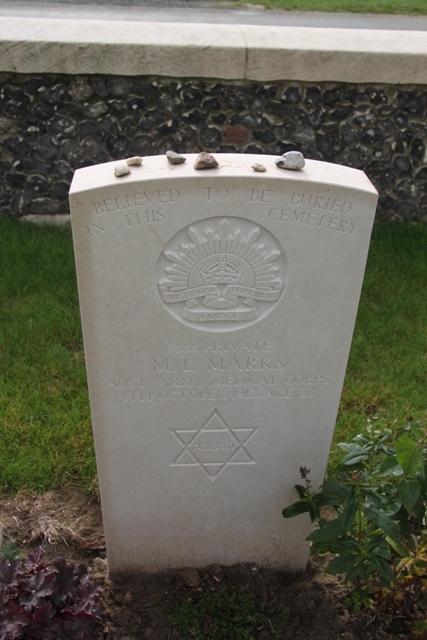 The headstones are immaculately tended and the atmosphere is peaceful and respectful. We walked and looked. 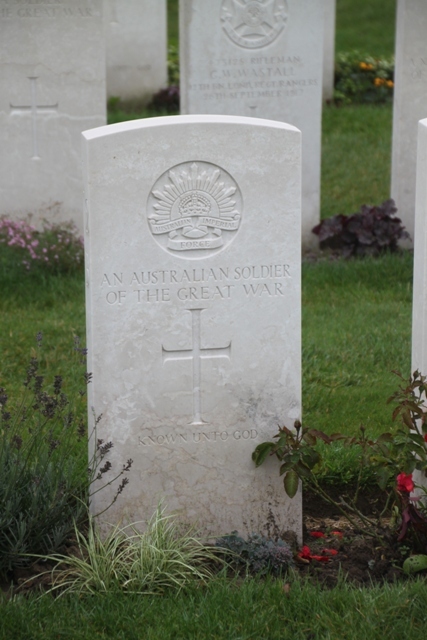 Son had bought earlier a poppy cross and spontaneously decided to lay it on the grave of an unknown soldier. 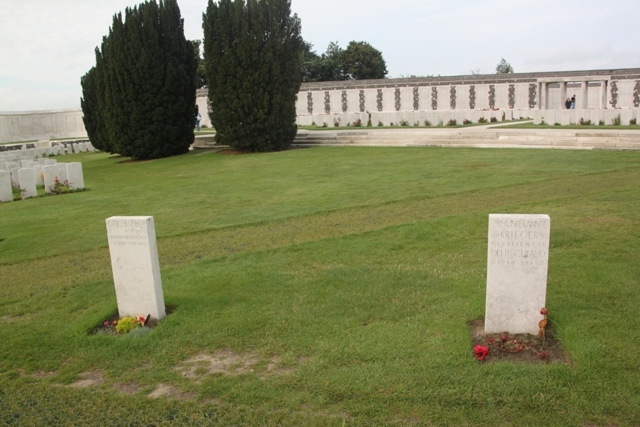 We sought out the graves belonging to four young German men also buried here. Only one has been named. This is one of the “Silent Cities”, somewhere you cannot easily get out of your head, nor should it be. Always a sombre experience to visit a war graves cemetery. 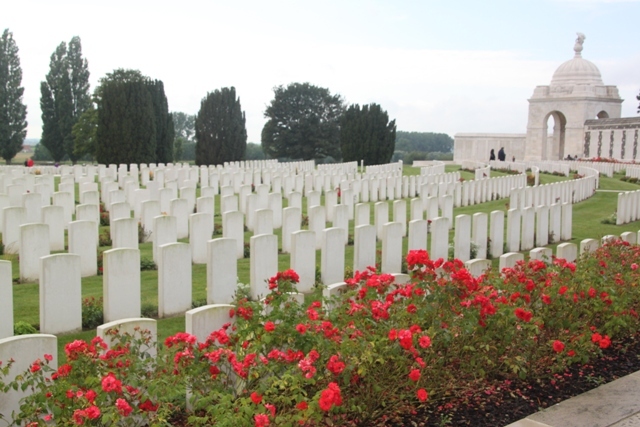 A few years ago I went to Étaples which has a similar number of graves (12,000) and I was left speechless bythe rows and rows of pristine headstones standing like soldiers on parade. No matter how much you read about these places or how many pictures you see of them, when you actually visit it just really hits home. Very moving. I get the same sort of feeling in US Civil War cemeteries and Arlington which we visited last year – when will we ever learn the futility of war. Rhetorical, and glib, question, but I do despair. We visited Arlington years ago and it really stuck in my memory, incredible place. Completely agree with your comments Anabel and a place like this just drives that home. A place like this really hits home doesn’t it Rosemary, just the sheer number of white gravestones and the ages of the young men is unbearably sad and poignant. Like you say though lessons never seem to be learnt! I found it so moving here, we visited Arromanches close to 20 years ago too but I have only just booked a house in Normandy for next summer so plan to return then, all being well!! Have a great weekend too. A month would be perfect Rosemary – unfortunately we will only have a couple of weeks, someday…. At least a couple of weeks is a reasonable time for a break Joy but I know what you mean. Even though we usually take 3 to 4 weeks for visiting the Uk a lot of that time is taken up with family and commitments and we get about 10 days at most for a break. One day we hope to have more time…..! Sad and sombre, the futility of war really gets to you in a place like this. Very true. 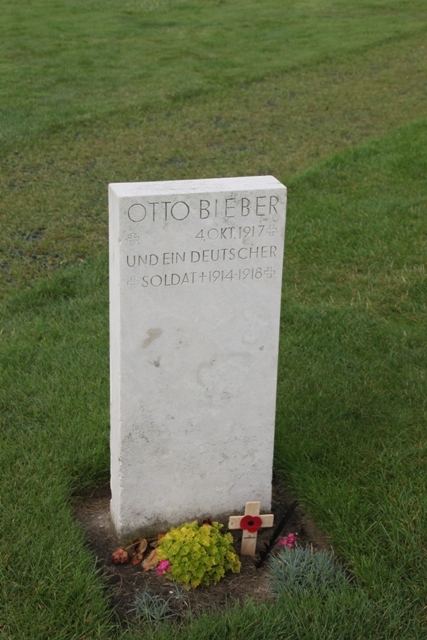 Someday I hope to see some of the cemeteries in Europe of the World Wars. Your photos do a wonderful job of showing the overwhelming feel of the huge number of headstones and expanse of the cemetery grounds. I’m sure you’re right that, seeing it in person, affects people WAY more than just hearing the numbers. The cemetery looks like a serene and lovely resting place. The cemetery is incredibly beautiful and so well maintained and looked after – definitely a lovely resting place. You just can’t get out of your head though the vast numbers of young men slaughtered in this area and the ages on the headstones make it even more poignant. Very moving, Joy. Reminds me of the American Cemetary in Normandy, though I have never seen one that flashes faces in a wall like that. Very sad. Thank you for sharing and have a nice weekend. Thanks George! The faces appearing on the wall was a simple thing but very haunting and mesmerizing. The cemetery had a big effect on us, not a place you forget ever. Hope your weekend is a great one too! An incredible place to visit, we found it sad, moving and like you say humbling….. so glad we got the chance to go there. It makes you take stock of things and feel incredibly humble. It is impossible not to be moved by the rows upon rows of near identical, stark, white grave markers in war cemeteries. All those lives so abruptly cut short is quite arresting. As a family historian, I find myself frequently stumbling across a boy in the 1911 Census and knowing he has but a few years to live before he dies in France or Belgium. 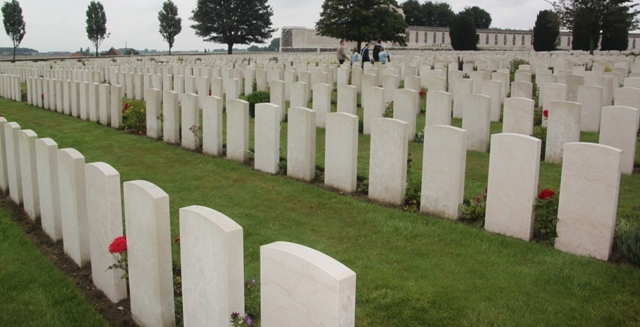 The scale of the tragedy of WW1 – of both World Wars – is incomprehensible. 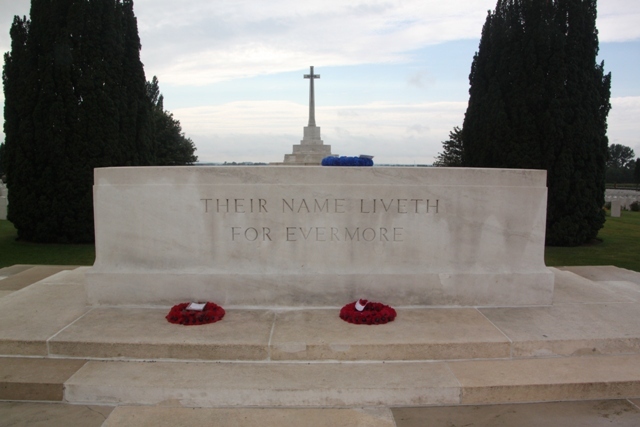 I have family members buried at Tyne Cot so it is another war cemetery I must visit some time. You must visit here Laura, it is an unforgettable experience. Thinking about your Census comments just sent a shiver up my spine, so tragic. Yes, the Census thing gets to me every time. I love that you took your son here. It isn’t the first place that comes to mind with kids, but now that I think about it my girls are fascinated with graveyards and cemeteries. Always trying to come up with new ideas..thanks for this one! We had plunged ourselves into the whole history about WW1 beforehand and knew about the numbers of young men killed in the conflict but seeing it stark and clear before your eyes here really hit a nerve. Our son was just as moved as we were. Now that I think of it though, we have been to graveyards and cemeteries in different places and always found them intriguing – Key West, New Orleans, Paris etc. you can find some fascinating stuff there. 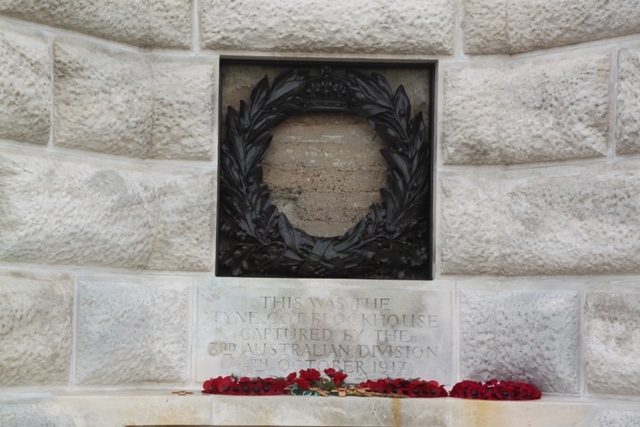 Very moving and sombre Joy, it’s reading these posts of yours that makes us realise how lucky we are, and how much we owe to all these relatively young men who died for their country. Your son is amazing too, I thought that was brilliant that he should feel compelled to place the poppy on one of the unknown soldiers’ graves. We felt very humbled and very grateful visiting this place for those young men and what they did for us. I was glad when my son decided to do that, shows this place got to him and much as us!! It is an incredible place to visit, very moving and very humbling. No I can imagine your visit lingers on your mind for a long time. It seems strange to visit a cemetery, when you think of the context but it’s important to pay respect to the lives lost – all 11,956 of those buried. 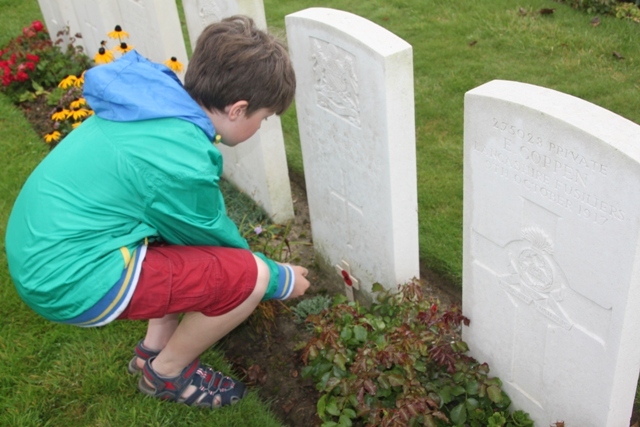 That’s very sweet of your son to lay a poppy at a grave. I was proud and pleased that he decided to do that. Shows the effect this place had on him. Paying respect like you say is so important. Thank you Pam, I hope he remembers these places and this incredible history lesson and in some small way, tries to make his world a better place! Unfortunately that quote just sums us up perfectly. But yes, I agree, everyone should visit these monuments and reflect. 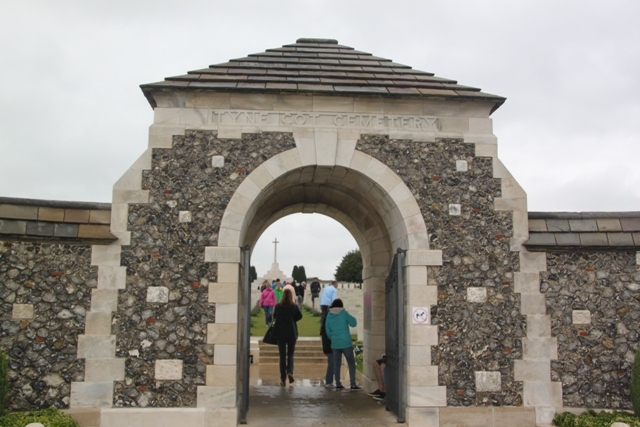 We visited the Western Front five years ago – catching up on your well-written posts has been a good reminder of that incredibly memorable trip. Thank you Hayley, we like you say, found it so memorable here too.